Letters From A Tapehead: White Hills: "No Will"
Taking a cue from Bauhaus' "Dark Entries," the psych-fuzz duo White Hills has released a new single called "No Will." This post-punk/gothic nod was pulled from the band's upcoming new release, Walks For Motorists, which will be out on April 6th via Thrill Jockey Records. After that, read up on the release. All info, links and sounds were supplied by Thrill Jockey Records. White Hills have been a fixture of the psych-rock revivalist scene for a number of years now, thanks to a sound that brought Hawkwind-style, blissed out cosmic sprawl down to an intimate scale. Their forthcoming new record Walks for Motorists (produced by David Wrench, who’s worked with FKA Twigs, Jungle, Caribou), was their first album they recorded outside of their native New York City, and the temporary move to the countryside in Bryn Derwen, Wales for the recording seems to have had the opposite of the effect you might suspect the pastoral scenery would have. Their brilliant new single 'No Will' which you can listen below, is a taut, almost gothic post-punk track that's reminiscent of prime-era Bauhaus... taking the pair’s psych trip to an intriguing dark side. Perhaps inspired by their work with Jim Jarmusch on the vampire movie Only Lovers Left Alive last year? Walks For Motorists will be released on 6th April and will be available on LP, CD and digital download. White Hills are proponents of psychedelia as transformation. The music made by Dave W. and Ego Sensation is risky and cutting edge, rooted in dystopian futurism and hyper-conscious of society’s constant desire for a new and better drug. 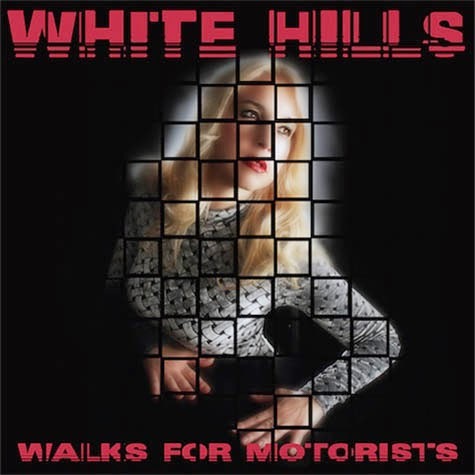 That progressive aesthetic is at the heart of White Hills’ forthcoming new album Walks For Motorists, their most daring and radically stripped-down record that emphasises rhythm and groove. The album bursts forth with a new kind of intensity, one born out of laser-focused precision and detail-oriented songwriting. Possibly surprising to fans familiar with the mega Hawkwind-style guitar squall of earlier albums... the songs on Walks For Motorists began as a keyboard melody or bass line, and several songs on the album don’t even feature guitar at all. This is propulsive, open music, surreal to its core but made to inspire people to get out of their seats and move. Walks For Motorists is the band's most diverse album to date. Fuzzed-out rockers sit comfortably next to kraut-infused grooves, and there are more vocal contributions from Ego than ever before.